This salad was absolutely fantastic with a simple balsamic dressing to tie it all together. The perfect lunch for a sunny spring day. If you think it sounds like a weird combination, try leaving out the beets (pistachio, orange, and avocado salad) or the avocado (pistachio, orange and beet salad) - see, not so weird after all. Seriously, pistachios make everything better. I just bought a huge bag of shelled pistachios at Costco and I'm using them on everything. Steam sliced beets until just tender. Toss with vinegar and chill - this is my absolute favorite way to eat beets. Arrange lettuce, avocado, orange sections, pistachios and beet slices on plate; drizzle with dressing. Serves 1. Chard is one of those veggies that's incredibly good for you, and it's at its best when dressed with balsamic vinegar and lots of black pepper. If you've never liked chard before, it's worth trying this way. A funny thing about chard is that it is naturally a bit salty, so I don't like to add too much salt when cooking it. It's actually the same exact plant species as beets, just bred for tender leaves rather than big roots. Amazingly hardy, chard is one of the best vegetables to grow in New Mexico because it can tolerate the intense heat of our summers as well as the cold nights of early spring and late fall. For these reasons, it is abundant at our farmers' markets three seasons of the year. 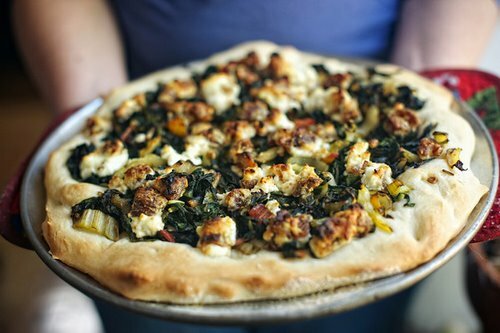 For this pizza, I combined Mollie Katzen's Moosewood Cookbook recipe for Swiss chard with the creamy, tangy sweetness of dried figs mixed with goat cheese. It's a perfect spring treat that's absolutely packed with vitamins and minerals. Try a whole wheat crust if you want to go extra-healthy. Roll the whole bunch of chard together tightly (leave the stems on – they're delicious!) and slice into 1/2-inch ribbons. Heat olive oil on medium flame and fry the garlic until fragrant, then add the chard. Cook until completely wilted and dark green, then toss with balsamic vinegar, salt and pepper. Soak the figs in just enough hot water to cover. Mix thoroughly with goat cheese. Preheat the oven to 450º F. Combine the yeast, sugar and warm water and let stand until foamy, about 10 minutes. Mix the flour and salt in a food processor or bowl. Add yeast mixture and combine thoroughly (or process for 45 seconds, until the dough pulls away from the sides of the bowl). Add oil and knead or process for another minute. If the dough sticks to the sides of the bowl, add more flour. Roll it out on a floured surface, or just stretch it to the right size with your hands. Place on a lightly oiled pizza pan. Top with chard and dot with goat cheese. Bake 20 minutes, or until crust is golden-brown. Serves 2 as a main dish. I've been meaning to re-create this fantastic dish we had more than a year ago at Joseph's Table in Taos. I don't know why I didn't get around to it sooner, and sadly, now that the restaurant is closed... making it at home is the only way. I didn't think I could possibly like kale more than I already do, but this was amazing. It's a simple appetizer or side dish, to be served with bread or crackers. I think they made it with red onions and fresh red tomatoes, which gave the sauce a lovely pink color. Today I only had yellow onion and some frozen yellow pear tomatoes that I had roasted in the oven with olive oil and salt last fall, so that's what I used here. I think it turned out pretty close. Yumm. Cook the onion in olive oil on medium heat until soft but not browned. Roll kale leaves together and slice into thin ribbons. Add kale to the pan, turning to coat with oil, and cover. Cook about 10 minutes, until kale is thoroughly wilted. It will steam itself, and may brown slightly on the bottom. Turn heat to low and add tomatoes, paprika, and goat cheese, stirring gently until warm and creamy. Add a little water or sherry vinegar to make it more saucy, if desired. Serves 2 as an appetizer or side. Look at that beauty of a radish! Yes, that's a Salad Rose on the side there, my first radish of the year. This variety grows up to 8 inches long and most amazingly, it's not woody at all - they have a wonderful silky texture, kind of like a baby turnip. I've always wanted to figure out a use for radish greens - they're so prickly I can't bring myself to eat them raw, but I know they're edible and they're so abundant. Well, my newfound love of eggs (fresh from the coop only) has made it ridiculously easy. As I'm sure egg-lovers know, you can mix almost anything up with scrambled eggs and it's wonderful. I almost feel like I'm cheating posting a recipe for scrambled eggs, it's so basic. The radish greens have a slightly bitter taste, not terribly sharp, which is a perfect complement to my homemade smoked bacon* and onions. This makes sense, because salty counteracts bitterness, according to culinary scientists. And the prickliness disappears when they're cooked for just a few minutes, so I'm sold. Radish greens really are good eats. Mince the bacon and onion. Roll the radish greens tightly and slice into thin ribbons. Brown the bacon bits on medium heat, then add the onion and radish greens and cook until just wilted. Beat the eggs in a small bowl and add them to the pan. Let them cook for 30 seconds, then gently turn them, letting the liquid flow to the edges of the pan, and cook 30 more seconds. Turn off the heat and gently turn the eggs over once more, to let them finish cooking without drying them out. Add salt and pepper if needed (the bacon usually makes it salty enough). *Yep, that's right... homemade bacon!! Yeah ok, I know this is a veggie blog so I won't go into it, but I just have to crow for a second. Seriously, I've pretty much decided I'll never buy bacon at the store again, it was so easy. I bought the pork belly at Keller's Farm Store in ABQ, and followed the recipe in Brian Polcyn and Mark Ruhlman's wonderful book, Charcuterie. Brine it for a week in a Ziploc bag, then smoke it (or just roast it) - that's it. Awesome, and cheap! Turnips are fabulously easy to grow, cold-hardy, and keep forever during the winter, which is why they're available pretty much year round. Too bad so many people dislike them. They're one of the few veggies I've had trouble learning to like. But spring turnips fresh from the garden taste so much better than the big purple-topped kind from the grocery store, it's whole different story! The tiny ones are almost like radishes, with a creamier texture (though still crunchy) and a milder flavor. This soup is a lovely, fresh-tasting way to use the last of the winter apples and turnips, or the first of the spring turnips. It's good hot or cold, as a light appetizer or accompaniment to a grilled cheese sandwich made with sharp cheddar. If you don't have stock, you can saute the apples and turnips until they caramelize a bit, then just use water. Slice the leeks thinly, swirl them in a bowl of cold water, then let the dirt sink to the bottom and the leeks float to the top. Melt the butter in a large pot over medium heat, and cook the leeks with nutmeg and thyme until just soft, 3 to 4 minutes. Peel the turnips if they are large. Add turnips, apples and broth – don't be tempted to add more liquid, because the apples will release plenty. Cover and simmer until tender but not mushy, about 30-40 minutes. Purée with an immersion blender, or in batches in a food processor. Season with salt and pepper, and stir in cream if desired. Garnish with chives (or perhaps a few bits of bacon, sharp cheddar, a pinch of nutmeg, or croutons). Serves 6 to 8 as a side or appetizer. Early spring is the most difficult time to find fresh local produce, because the fruits and veggies that keep well through the winter are starting to run out, and it's still too cold for gardening. But spinach, one of the most cold-hardy vegetables there is, can overwinter even in subzero temperatures if planted in fall and well mulched. Or it can be planted in spring, as soon soil temperatures reach 35°F! 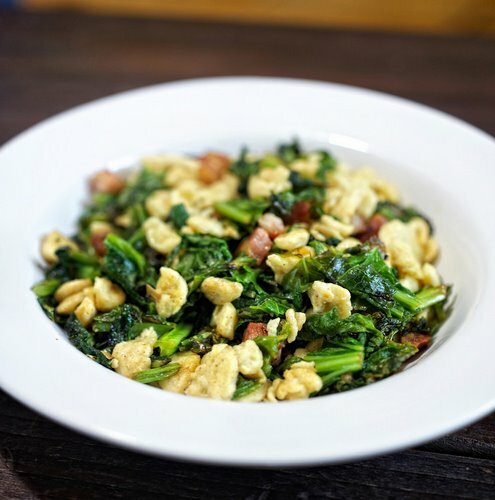 I often have trouble thinking of specific recipes for spinach, simply because it's so versatile – you can add it to just about anything for a touch of earthiness and a blast of vitamins and minerals. But mustard and sweet onions really complement its flavor. Spaetzle are tiny dumplings with a noodle-like texture, in this case flavored with mustard. This makes a lovely side dish, or you can add some leftover roast chicken, sauteed mushrooms, and/or pancetta to make it a filling main dish. This recipe is adapted from one posted to Food 52's “Your Best Spinach” contest, by blogger Christine of www.remakingchristine.com. Boil a large pot of salted water. 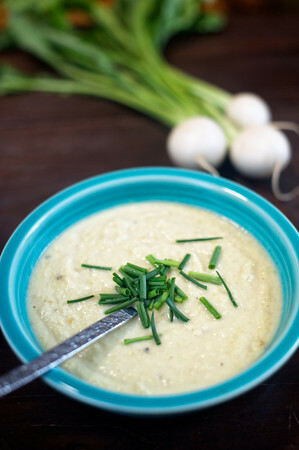 Whisk the eggs, flour, milk, mustard and salt in a small bowl. To make the spaetzle, push the batter through the holes of a colander (you need one with very large holes, at least ¼ inch) into the boiling water. Or just push small lumps of batter off the edge of a spoon. They're done when they float to the surface. Drain and set aside. Heat butter and olive oil in a large skillet on medium flame. Add the bacon or pancetta (if using) and brown. Add onions and cook for a few minutes, until translucent and soft but not browned. If using mushrooms, push the onions to the side and brown the mushrooms. Add the chicken, if desired, and just heat it through. Add the spinach and cook until just wilted. Add the spaetzle, toss to coat with oil, and cook until they get a bit crispy in spots. Serves 4 as a side dish, or 2 as a main dish. Since my revelation about rice and Spanish cooking in the past year, I have been wanting to try paella, but I've been daunted by all the hype and the special pan. 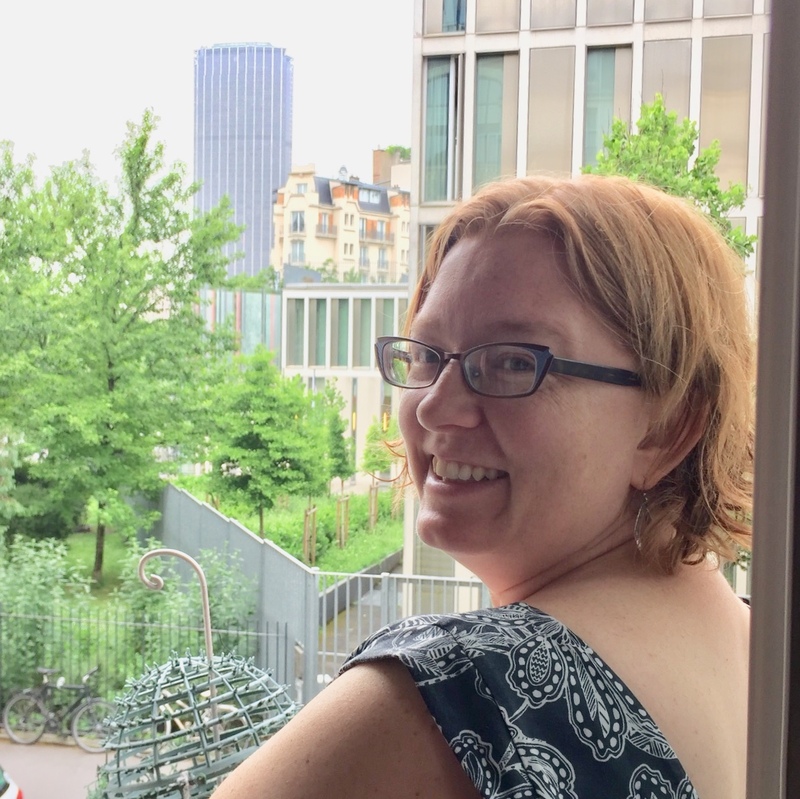 In The New Spanish Table, Anya von Bremzen discusses paella at length and actually makes it sound not so hard. What I love is when she asks a Valencian rice farmer what defines paella, he says it's more an activity than just a dish - the whole family crowds around the pan in the backyard. After seeing an Alton Brown episode where he cooks it on his charcoal grill, I knew we had to do it! The great thing is that you just fire up the grill as hot as possible, which is where our grill excels - years ago, a friend's dog chewed up the little vents at the bottom that help you control the heat, so now it's just full blast all the time. We like to use mesquite charcoal chunks (from El Mezquite Mexican grocery in ABQ) instead of briquets, because they burn really nicely and don't have a funky smell like some charcoals. I got Dave a paella pan for Christmas, 16 inches in diameter, which makes enough for 4-6 people. It's important that the rice be spread in a thin layer about 1/2 inch deep to cook properly. Cut the chicken into pieces - thighs, drumsticks, wings, and boneless breasts. Refrigerate until ready to use in the paella. Place the carcass in a large pot with water, onion, carrot and bay leaf. Bring to a boil and simmer for at least an hour. Don't add more than 1 teaspoon salt, because when it cooks in the paella, it will become more concentrated and you don't want it to end up too salty. Light 2 pounds of charcoal in the newspaper-chimney-thing and wait for it to turn grey on the outside. Rub the chicken pieces with half the garlic, the smoked paprika and salt, and let stand 15 minutes. Halve the tomatoes and grate them on the large holes of a box grater, discarding the skin. Trim the stems and pointy tops off the artichokes and peel away the tough outer leaves. Cut them in quarters or eighths and scrape out the chokes (the hairy part in the center). Add saffron to the stock and keep at a simmer on the stove. Get everything ready in bowls to take outside - the chicken, the remaining garlic, the grated tomatoes, the artichokes and beans mixed together, the rice mixed with the rosemary needles and hot paprika, and half the stock. Mix the burning charcoal with 2 more pounds of unlit charcoal, and spread evenly in the bottom of the grill. Replace the top grate and set the paella pan on it. Add enough oil to coat the bottom of the pan - it should be really hot. Sear the chicken pieces on both sides. Push the chicken to the sides of the pan, and cook the vegetables for a few minutes, until they start to get tender. Push the vegetables to the sides, add the garlic and cook until fragrant, about 30 seconds, then add the tomatoes and cook for another minute or two. Add the rice and rearrange so everything is distributed evenly across the pan. Pour 4 cups of stock evenly over the pan, washing the rice to the bottom and making sure all the rice is submerged. After this, do not stir the paella. Cook for about 10 minutes, until most of the stock is absorbed. Add 2 more cups of stock, focusing on areas that look dry. Cook another 10 minutes, until most of the stock is absorbed, then taste to see if the rice is tender (it shouldn't be quite done, it should have a little chewiness still). Add a little more stock to any areas that look dry, or where the rice is not as cooked. Remove the pan from the heat, cover with a clean dishtowel, and let stand 15 minutes. Serves 4 to 6. Lilacs might be my favorite flower. Their scent is so marvelous. Every spring, they just make me so happy for the two weeks or so they are in bloom. I have three lilac bushes in my yard - one light purple, one white, and the third has the most amazing dark purple blossoms with a white edge around every petal. I've seen crystallized lilac blossoms, each tiny blossom individually dipped in egg white, then in superfine sugar... they're beautiful, but way too labor-intensive for me. So I thought I'd try out a few other lilac concoctions, like lilac sugar, lilac syrup, and lilac-infused vodka. To make lilac-scented sugar, I read that you should layer the blossoms with granulated sugar in a jar for three days, then sift out the blossoms (any longer and the blossoms start to turn brown and get yucky). I put the cap on the jar, and when I opened it up, the sugar was moist from the water in the blossoms. Maybe you could avoid this problem by leaving the lid off, but then it seems like the scent might not soak into the sugar. Also, it was not very strongly scented, so maybe I needed a lot more lilac blossoms. So, hmm. Not exactly a success. To make lilac-infused vodka, I soaked the blossoms in vodka for 24 hours. This did not turn out well at all. When I opened it up, the blossoms had turned brownish, and it smelled and tasted funky. Maybe it just needs a much shorter soaking time. Some say not to wash the blossoms because you wash off some of the fragrance, and this kinda made sense to me since the fragrance is so delicate. So at the end I strained the syrup through a few layers of cheesecloth to filter out any dust that might have been on the blossoms. You can't boil the water first and then add the lilacs, because they will wilt immediately and turn the syrup really bitter. They need time to infuse at lower temperatures before they wilt. In fact, don't really let it boil at all, just come right up to boiling and stop. You really must take it off the heat and strain it immediately, as soon as the blossoms are wilted. If you taste it before this point, you will notice it already tastes like lilacs. As soon as it starts to develop a vegetal, sort of grassy smell, it's starting to get bitter. After straining out the blossoms, it actually came out a pale greenish color, so I added a frozen blueberry and cooked it a little longer to make it a nice lavender color. Interestingly, the syrup doesn't really smell like lilacs, but it tastes like they smell. Shake with ice and garnish with lilac blossoms. The acid turns it a lovely shade of pink. I liked the gin and lemon juice version best. But maybe that's because I used Hendrick's gin, which is delicious on its own. Tat soi is a tender Asian green with a delicate mustardy flavor, much like bok choy. It makes great salad when the spoon-shaped leaves are tiny, but it's better lightly cooked later in the season when it gets bigger. If you can't find it, just use any kind of tender greens. The spicy flavors of radishes and tat soi marry perfectly with this carrot dressing, adapted from a Sunset Magazine article. Boil the carrot juice in a wide pot over medium-high heat, until reduced to 1/3 cup, about 25 minutes (if you don't have carrot juice and don't want to go out and buy it, see below. *) Let this cool, then whisk in the remaining ingredients. If desired, wilt the tat soi by steaming or microwaving for a minute or two, with just the water that clings to the leaves after washing. 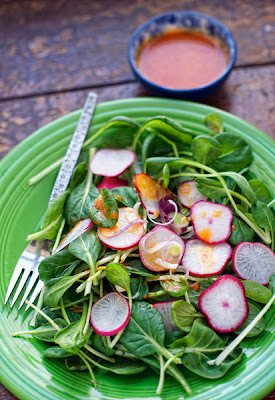 Arrange with the radishes and green onion, and drizzle with carrot dressing. Serves 2. *To make carrot juice, you can chop and boil a few carrots until they are tender, then puree them with enough water to get a smooth texture. Squeeze the puree through a clean flour sack type dish towel to get the juice out. Lay the towel (just 1 layer) inside a strainer and pour the puree in, then take up the corners of the towel and twist to make a sack with the puree inside. You should be able to squeeze the juice out slowly by twisting it tighter. Or if you have patience, you can leave it in the fridge overnight and see how much drips out. This technique also comes in handy for making cantaloupe juice!